Will it work on the Kindle Fire? How do I get the Android Version? How do I get the iPhone or iPad version? How do I get the Windows Phone version? How do I get help using PocketWGU? Is PocketWGU Available for BlackBerry? Q: Will it work on the Kindle Fire? PocketWGU works on all 2nd-gen and later Kindle Fire tablets (running Android 4.x+). PocketWGU is available from the Kindle Fire App Store right on your device. 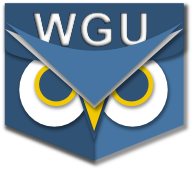 Simply choose "Apps" and search the store for "WGU" to find and install PocketWGU directly onto your Kindle Fire. Q: How do I get the Android Version? The Android version is available via Google Play (a.k.a Android Market). It is also available from the Amazon Android App Store. If your Android device does not have access to the Android Market, the latest version may be downloaded directly from a link at the bottom of this page: http://pocketwgu.geofinity.com/latest/. Q: How do I get the iPhone or iPad version? The iOS version (for iPhone, iPad, and iPod Touch) is available from Apple's iTunes App Store at the following URL: http://itunes.apple.com/app/pocketwgu/id464673280 The app may also be found within iTunes by searching for "WGU" or "PocketWGU". Q: How do I get the Windows Phone version? Q: How do I get help using PocketWGU? The quickest way to get help is to post a message to the Support Forum or simply send us an email. Most questions are answered in less than a day, no guarantees though! Q: Is PocketWGU Available for BlackBerry? Kinda, sorta, but not really... The latest version of Research in Motion's (RIM) BlackBerry platform, BB10, will run specially built versions of Android apps. There is an experimental build of PocketWGU for that platform available at the following URL. This will only run on BB10 devices including the BlackBerry PlayBook, but won't install or run on any BlackBerry phones released before 2013. You may click here to download the experimental release for BB10 / PlayBook.